This is my favorite time of year, spring into summer, or sprummer. The days keep getting longer, the energy keeps building around us and the fruits of our hard work finally start to hang heavy on our branches. The general sense of abundance and whimsy always seems to be the perfect distraction from the usual, albeit beautiful, chaos of life. The freedom of summer is right around the corner, with fewer responsibilities and more time to spend with friends and family soaking up the sweetness of life. Warm nights spent on the patio eating, laughing, and reminiscing are the perfect antidote to the usual hustle of life. Laughter alone has the power to fill almost any hole in your spirit, but mix a good belly laugh with a full stomach and you get a big, full heart! Pho, pronounced ‘fuh’, is a reminder to slow down and savor each bite, each moment and each smile. 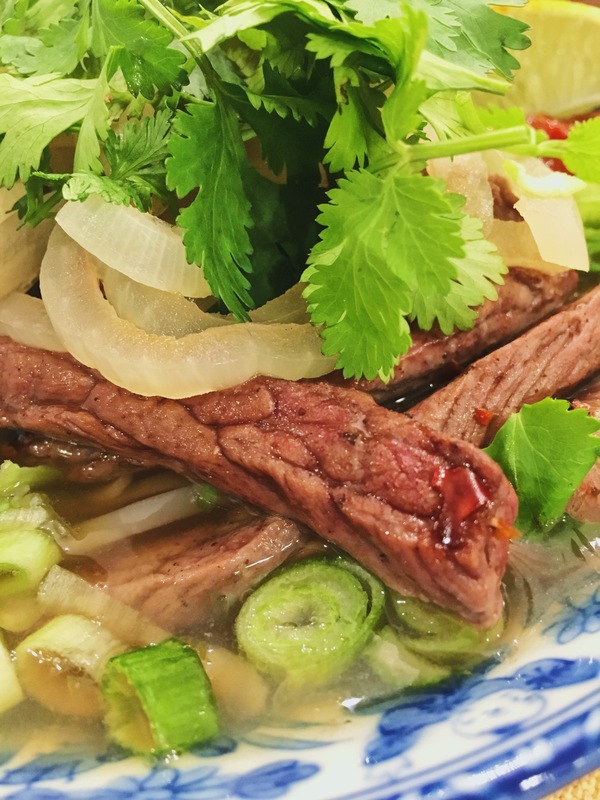 A Vietnamese soup made with savory broth, wide flat noodles, grilled meat or veggies and bright, fresh herbs, Pho is a staple in many Asian restaurants. Soup? Yes, soup! Trust me, this is light enough and bright enough to enjoy any time of the year. The usual process for making pho is a day-long process of charring onions and ginger, boiling oxtails with lots of spices and finally assembling your meal after lots and lots of work. Quite frankly my friends, I just don’t have the kind of time! Between teaching a lot of yoga, working a second job (I’m a trained pastry chef) and following through with the seemingly endless responsibilities of life, an all day broth just doesn’t work for me. Add in the usually high salt content and extra cost of eating out, and you got the perfect reason to make this dish at home. The essential element of pho is the broth. Cinnamon, cardamom, cloves and star anise impart the succulent, deep, slightly sweet flavor; it’s the perfect vehicle to carry home the fresh ingredients and tender meat. The meat is your choice: beef (Pho Bo), chicken (Pho Ga), pork, shrimp, or firm tofu are all perfect choices for your protein. Traditionally, pho is always made with the spiced beef broth but chicken and vegetable broth are appropriate substitutions to meet your specific dietary requirements and particular tastes. Make sure you choose good quality, low-sodium broth so that you’re in control of the whole process. 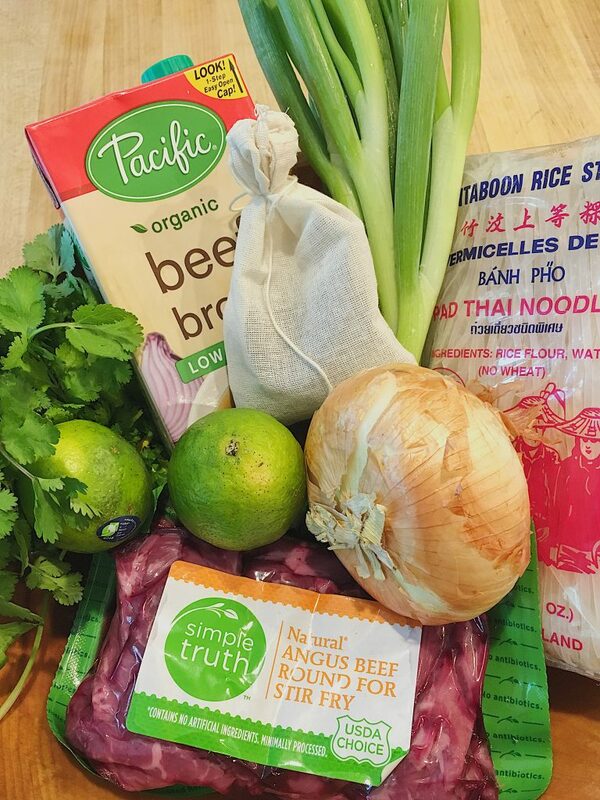 Colonel De Herbs and Spices, who just happen to be our neighbors, ingeniously offers cloth bags filled with the pho broth spices ($3.99) to make this dish even easier. You toss the bag in the pot with the broth and gently simmer away, just like steeping tea, for 2-4 hours and then discard. Although I couldn’t resist cutting open the bag and checking out the bloated spices. We’ve all got the inner child, right? This dish is perfect for 2-4 people and is easily multiplied to feed groups. 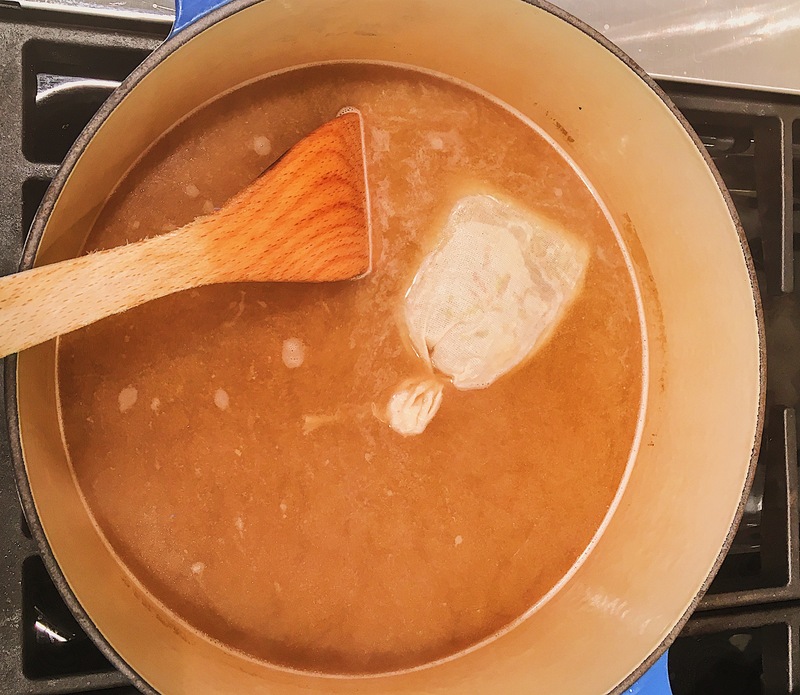 You can make large batches of the broth and freeze for later use. You know I’m all about saving time! Add both boxes of broth and the spice sachet to a large heavy pot and bring to a simmer. Cover, reduce heat to low and continue to simmer for at least two hours, although longer, up to four, imparts an ever deeper, richer flavor. Remove and discard the sachet before serving. When the broth is almost ready, bring a medium-sized pot of water to a boil and preheat the broiler on high. On a broiler-safe pan, combine the beef and onions with salt, pepper, a dash of allspice and a few chili flakes, broiling 2-3 inches from heat for 7ish minutes, until the beef is cooked to your liking and the onions are softened and slightly charred. Cook the noodles for 3 minutes and drain. Assemble your bowls starting with the noodles, beef and onions. Ladle over plenty of broth (truly my favorite part) and add your fixings and sauces. 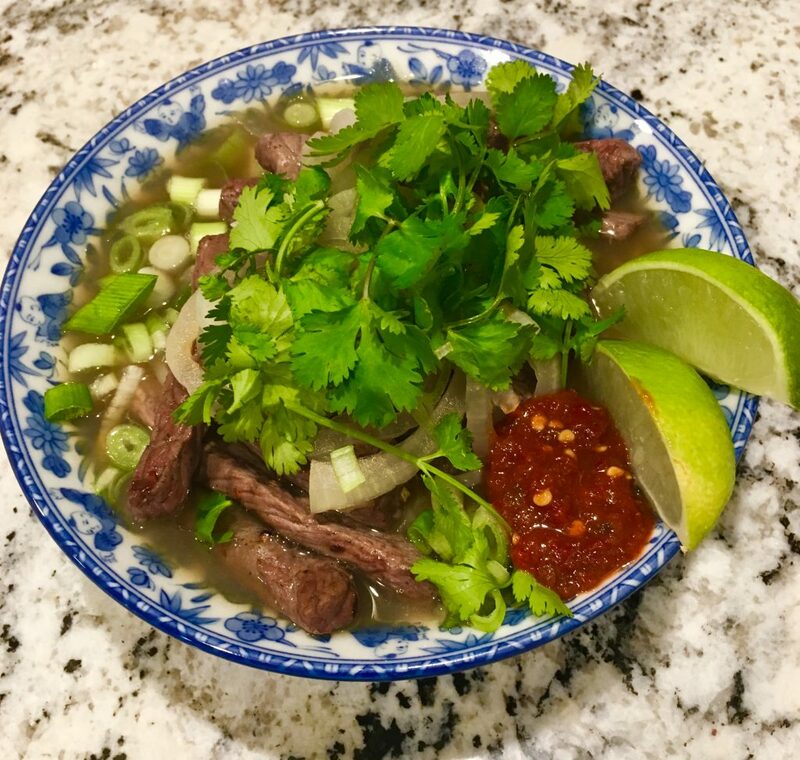 Limes, sriracha, cilantro, jalapeños and bean sprouts are requirements in my house but offering a variety of ingredients makes each bowl a personal masterpiece. Half the fun is building and customizing your bowl. Remember, you can always add more but you can’t take it back: spices, heat, salt, time. Slow it all down and savor each bite! You’re enjoying an age-old, good for your soul, perfect for summer, light and nutritious, big bowl of love. Coming Soon!Pump the Brakes, Sailor! Mint Yoga Studio was developed with a very simple idea – to create a warm and inviting space where you can explore and discover your own practice. Our goal is to provide you with an experience that will energize the body, refresh the mind and inspire the spirit – in a unique and beautiful space.